This is a steal for $30.00, especially if your on a budget. I found magazine subscriptions for $1.60 after applying a 20% off coupon. Use code JUNE for 20% off. * Please allow 6-14 weeks for processing. * Magazines can only be sent to US addresses. * Gift subscriptions are accepted. * We do have other magazines that are not listed here. If you would like a quote on your favorite title, email us and we'll get back with you ASAP. The Sarah Palin affirmative action pick reminded me of a situation that I experienced when I was stationed in South Korea. When I was in Korea we had a new Sergeant Major (highest enlisted rank) come in and replace our very caring, mild mannered Sergeant Major. The new Sergeant Major was unqualified (she had never led soldiers) and obviously was promoted because she was Black and female. She used to always say: “fake it ‘til you make it”; it was obvious that she was faking it. She was loud, wore faddish wigs, and was always twirling her neck and pointing her finger in someone’s face. 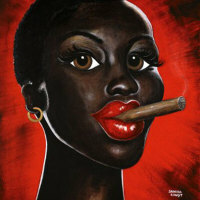 She embodied the stereotypes of Black Women. As a Black Women I was offended that she attained the highest enlisted rank in the army with fewer qualifications than the soldiers that she led. McCain Is The Real Sexist! I have been waiting for someone to call McCain out on his blatant sexism. If the McCain campaign truly wanted Sarah Palin to be treated equally they would allow her to open her mouth to show her intelligence or lack thereof. But you see they do not want her to be treated equally. The campaign wants Mrs. Palin to be held to a lower standard and have been fairly effective doing so. Their tactic of calling anyone that says anything critical of her or questions her record, sexist is in itself sexist. If you are so stupid that you are not allowed to answer questions then you need to go back home. The fact that she needs to be protected shows that she was chosen for her ovaries and good looks rather than her brain.